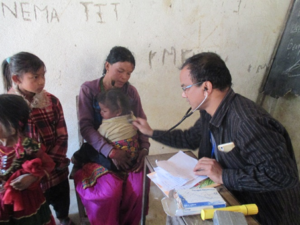 Leveraging over 20 years of nutrition expertise, NYF started conducting nutrition outreach camps in 2011, bringing life-saving services to isolated, rural communities. The outcome of Nutritional Outreach Camps is truly profound. Children’s newfound health is sustainable long-term as the model relies on locally available, inexpensive, nutrient-dense foods that families often grow themselves. agencies, the team identifies the areas for the camps and assesses the need and community readiness through field visits. Through each two to three day camp, NYF reaches 500-800 children and their caregivers — many of whose health and lives are forever transformed thanks to supporters like you. The goals of this program are two-fold: intervention and prevention. While most children get better, at least 14 children are likely to be diagnosed with severe malnutrition warranting immediate intervention. These children are transported with their caregivers to the closest NRH for treatment. Doctors, nurses, and nutritionists provide children specialized medical and nutritional treatment while caregivers receive hands-on training on nutrition and health using locally available ingredients. After an average of just three weeks at the NRH, children are restored to good health and can return to their village with their caregivers who share knowledge with others in their community. Thanks to your generosity, some of the most at-risk children in Nepal have a chance to lead healthy, productive lives.